“Don’t judge a book by its cover” is a quote that could not fit anyone else better than Nasir Sobhani. Drug-free after many years of addiction, Nasir Sobhani reinvented himself. 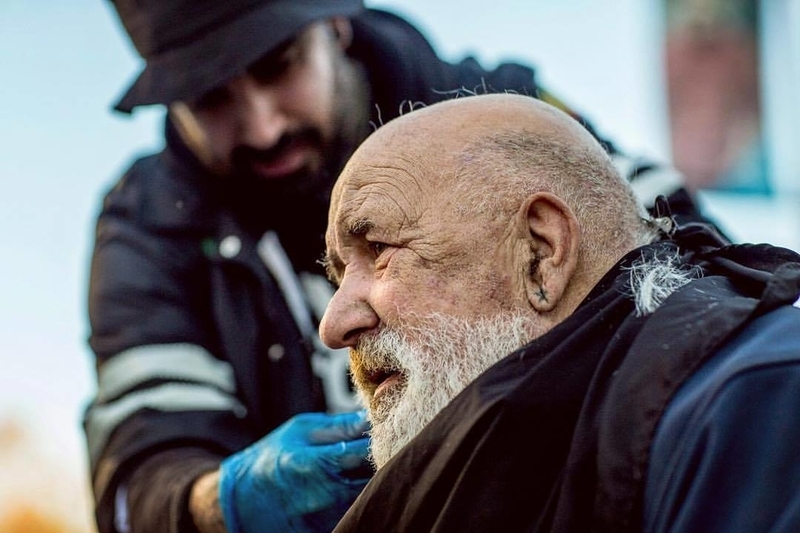 Dedicated to helping those who need it most, Sobhani, who is also known as The Streets Barber, offers free haircuts, a conversation, and a moment of friendship, caring, and love to the homeless. I had the privilege of speaking with this beautiful soul on his journey to compassion and his sole purpose of serving mankind. Victoria Adelaide: You’ve been clean for seven years. Can you tell us a bit about your journey and how you stopped using drugs? Nasir Sobhani: People are always saying the way kids turn out is often the result of how they were raised. I’m strongly against that theory because it’s not always the case. I come from a good family. My parents are angels; they raised me and my brothers well. Growing up, my mother worked two jobs and my father traveled around a lot for his business. My brothers never got into drugs and they were amazing students. They went to one of the best universities in Canada and traveled the world working for nonprofit organizations and volunteering. Because I was the youngest, I still had to attend high school and I lived with my mother on account of her working two jobs. When I would return from school, no one would be at home, so I would go to the park near my house and play basketball with the kids at the basketball court. Some of the kids that would hang out there were not good influences; they were drug dealers, drug users, and some would be in and out of prison or police custody. Hanging with them led to me casually smoking weed, which introduced a different lifestyle to how I was raised—because no one in my family would do this. I started doing more and more drugs, heavier drugs, and things just changed. VA: What prompted you to get off drugs? NS: I quit seven years after I started because I was losing everything. I was no longer close with my family, my girlfriend left me, my friends didn’t want to be around me, I had no money, no excitement, no joy, no ambition, no goals—nothing. Once, I almost died from overdosing. For many years, my family tried to help by making me go to rehab, but I was always doing it for them. So, after that night when I almost died, I decided I needed to go to rehab on my own and, three weeks later, I went. This happened six years ago in Canada and I’ve been drug-free ever since. VA: It seems that sometimes one needs to take the dark path to find one’s way to life. Luckily, you woke up and got your life back. NS: Yes, absolutely. People often realize they need to change when they lose everything. Until it happens, they don’t feel the need to change. People wanted to help me, but they couldn’t. They weren’t encouraging or enabling me and, because of that, I felt like I had nothing going on. My family loved me but they didn’t support the addiction. So, it was either drugs and addiction or them. They remained firm by not enabling me but I knew their love was there if I wanted to change. And, if I wasn’t changing, I was making it hard for them to show me love. VA: When did your passion for cutting hair begin? NS: Growing up, I was always cutting my friends and family’s hair, just for fun, and they would always say, “Why don’t you do this as a career, as a job?” I would always get angry with them because I thought they believed I couldn’t do anything else. For years, I studied at university to become a teacher and, in my final year, my drug addiction got worse. I had to go to rehab. It’s during my time in rehab that I realized I could live for myself. I knew if I could become drug-free, it didn’t matter what I did, as long as I was staying clean. Plus, my mother always told me that it didn’t matter what I was doing as long as I did it in the spirit of service—if my career was of service to mankind, my family would support me regardless of my profession. 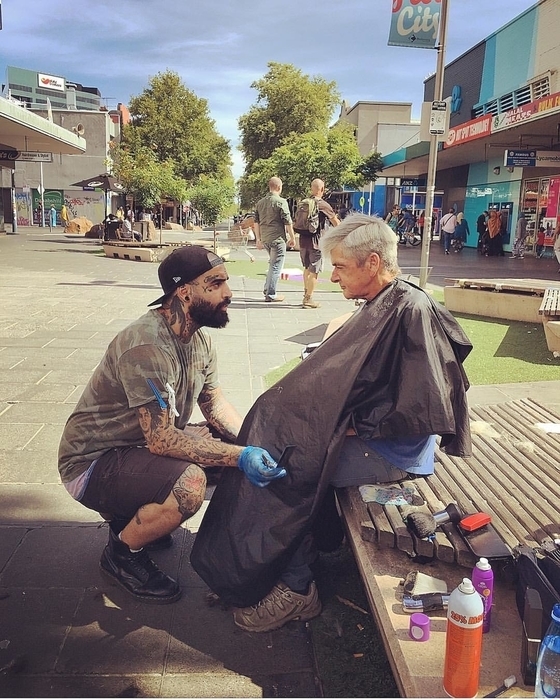 That’s how “The Streets Barber” happened when I moved to Australia after rehab—but it didn’t start until after a few years after I arrived. 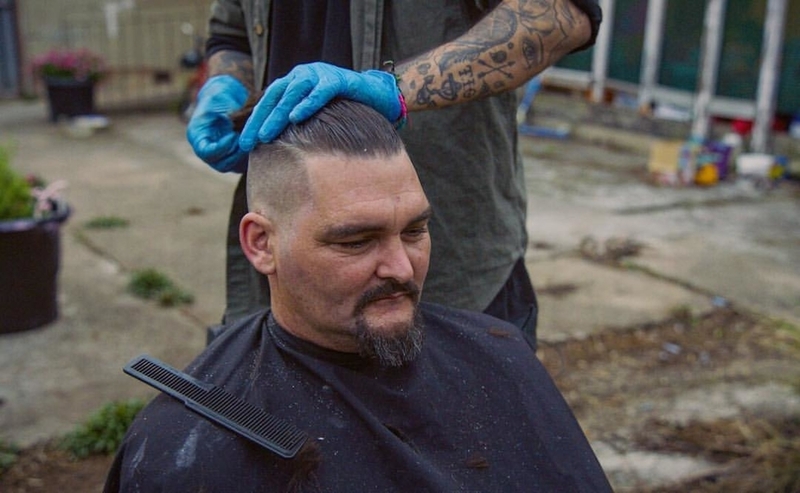 For me, moving to Australia was the beginning of my drug-free life; my drive was to become a barber. I started working as an apprentice, watching people cut hair and getting formal professional training. I spent so much time learning that I didn’t do what my mother encouraged—to serve humanity with whatever I would end up choosing as my career. 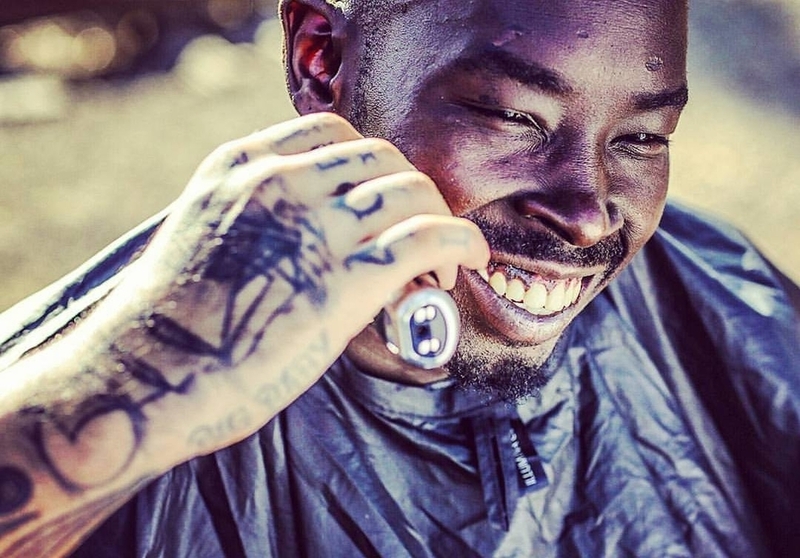 After maybe six months cutting hair as an apprentice, which was possibly two years after I arrived in Australia, I realized the joy people experienced after they got their hair cut. 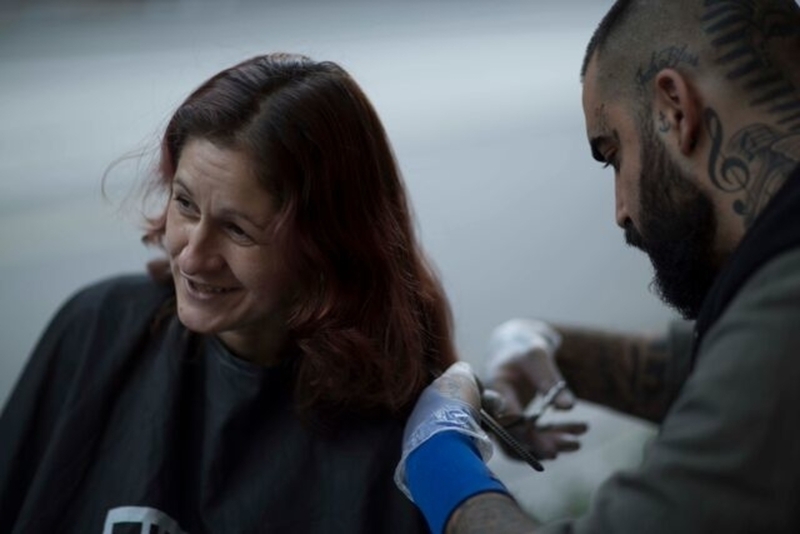 Then, I made the connection: I could make people feel happy by simply cutting their hair. 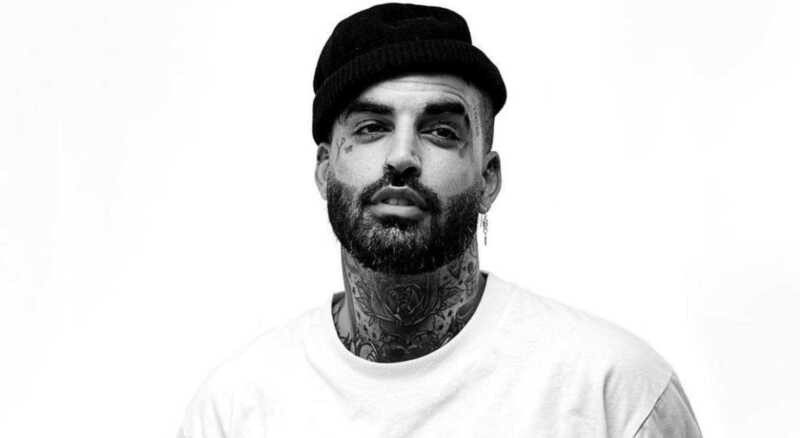 I knew the feeling; I experienced it when I was a drug addict—when I was having a hard time, hating myself, I couldn’t even look at myself in the mirror. Then I thought, if I can make people feel happy when they hate themselves, that is the greatest gift I can give and what my family encourages me to do—to serve humanity. VA: You said cutting hair is your new high and what keeps you from drugs. Do you think a lack of purpose can lead to drug addiction? NS: I think the best way to stay away from addiction is to be truly happy. Then, there is no need for you to escape. However, you can be doing something you’re passionate about but still feel unhappy. Whatever the reasons are, addiction is an escape. I realized I was doing drugs because I felt ashamed of not being like my family. I wasn’t helping out in the world; I wasn’t traveling the world servicing mankind; I wasn’t going to the best university. Instead, I was doing drugs and not doing well in school. I was unhappy and insecure. VA: Do you find something common among all those people you give free haircuts? NS: Yes, they all have great hearts. They are all beautiful people; they are just going through a hard time. All they want is to be loved and heard. At first, some are a bit harder to read than others, to see their beauty and love but, at the end of the day, the common theme is that they are all someone’s child, someone’s son, or someone’s daughter. They were all children at one point and they didn’t want to be in the situation in which they found themselves. Certain life experiences led to specific circumstances. All I had to do was open up and show them love and the reciprocation was there. VA: What are the most common prejudices people have about the homeless? NS: They identify homeless people as different people. Homeless people are regular people; they’re just going through a rough period. People think because they’re homeless they’re different but they’re not. Everybody thinks they are drug addicts, but there are people who aren’t homeless who are drug addicts too. 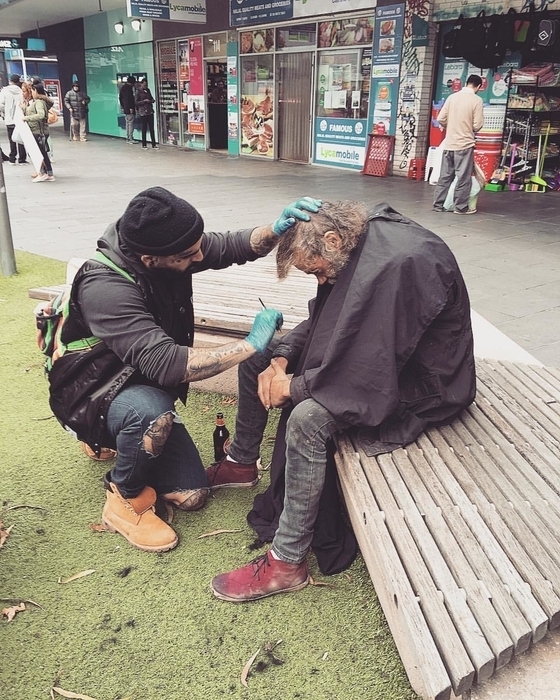 There are many people who aren’t homeless and are alcoholics as well, and if they see a homeless person they say, “Oh, he is homeless because he is an alcoholic; he is different.” They think there is a difference between an alcoholic who is on the street and one who is in a home. That is not the case. He is an alcoholic because he is an alcoholic, not because he is homeless. Sometimes, people just happen to be on the street because they don’t have the opportunity to be in a home. It’s that simple. There is no difference. VA: How would you like to expand? NS: I want to go around the world doing what I do. I love cutting hair. I can do all types of hairstyles. Getting the stories, learning about cultures, and helping people out is my dream. But I don’t get money for giving free haircuts. I need people to help me get around but I don’t know how because I don’t have a charity or anything—I do everything myself. My vision is world-embracing. That’s something the Bahá’í Faith says: “Let your vision be world embracing.” And that’s what it is for me. I’m looking at the world now; I’m not just looking at my community. VA: Every Sunday, you organize spiritual sessions. Can you tell us about that? 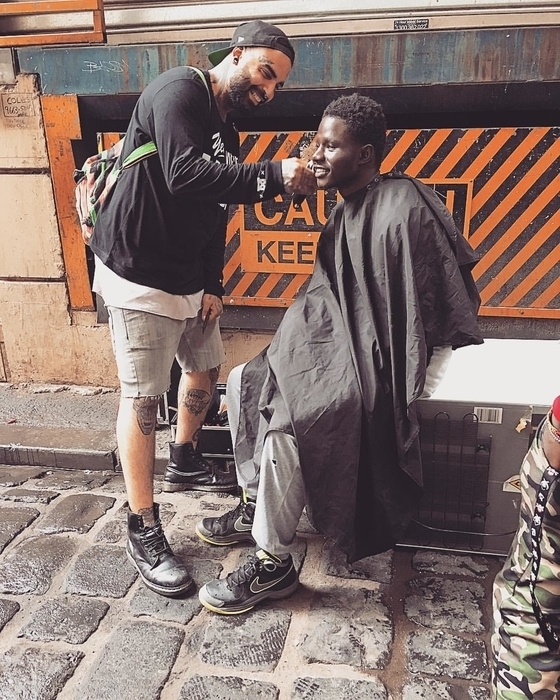 NS: The reason why I started “The Streets Barber” movement is because I’m a Bahá’í. The Bahá’í Faith, for me, is the biggest driving force and the reason I’m doing what I do. As Bahá’í’s, we encourage everybody, no matter their beliefs, to come together in one unified world. So, at these spiritual sessions on Sundays, the only rule is that we must respect each other. We don’t try to lecture or preach or anything like that. We read various scriptures or writings, religious or not, which elevate our souls and lift our spirits. Through this, we allow a space for people to understand our individual beliefs and become educated in what everyone else believes spirituality is. The more we become educated in other people’s beliefs, the more accepting and open-minded we become and that is when we realize we all have the same goal, which is unity and love—and that is the fundamental pillar of the oneness of mankind.